It’s a rainy, wet, foggy day here at Henwoodie. No snow for Christmas this year. 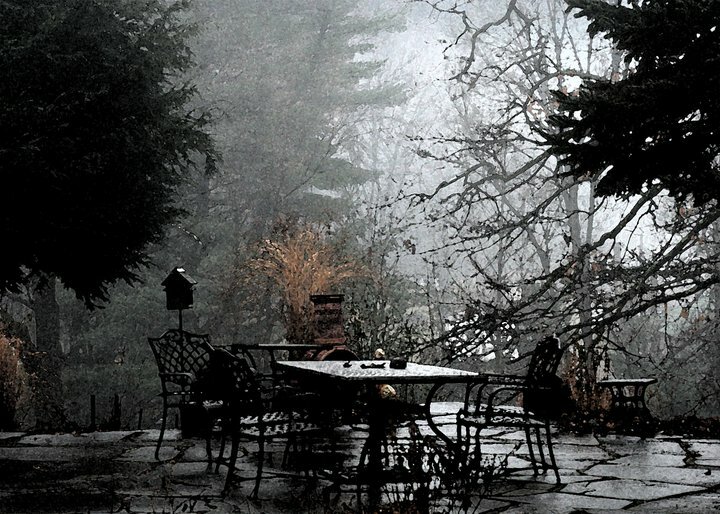 But, still, the thick fog gives the mountains and gardens a haunted, expectant atmosphere that is perfect for the holidays (if we can’t have snow, that is). The first house guest for the holidays arrives today! We are excited! He’s a good friend and we always have lots of laughs and fun together. And he loves ALL the pups! He only has one wee pup named Eli—the sweetest pup you can imagine. This afternoon I will drive up and over the mountains to pick up our fresh turkeys—one to cook on Christmas Day, the other to roast when my family arrives the day after Christmas! We will be crammed to the rafters with people and dogs! Just the way we like it! Two large hams and more fruit, vegetables, fresh-baked good being delivered tomorrow will be on hand so that everyone is certain to find something that they want to eat and eat and eat! The marathon baking begins this afternoon as well. I’ll bake gingerbread cookies, oatmeal cookies, sugar cookies, etc. 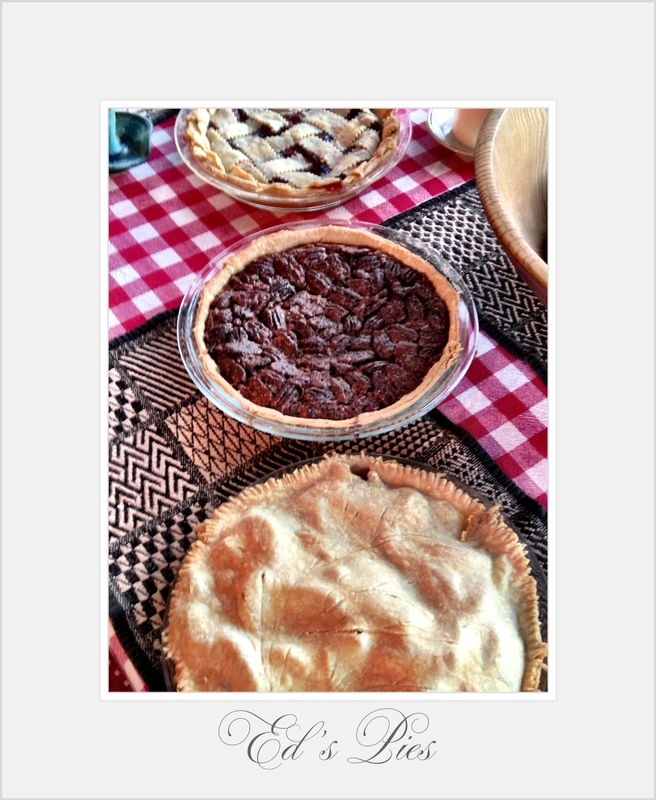 Ed will make his family pies: pecan, apple, and cherry! 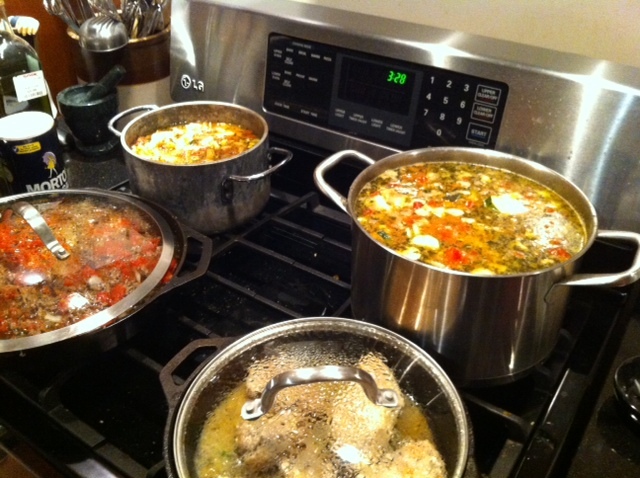 In addition to all the roasting I will also make my famous chicken soup so that no one has to feel hungry while I’m busy elsewhere. 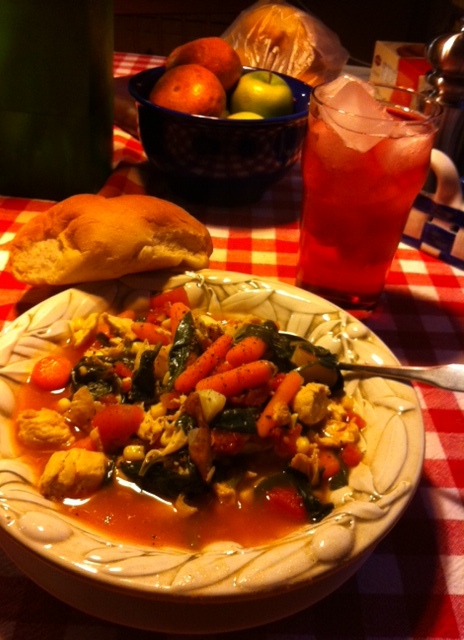 A hot, steaming bowl of chicken soup—made MY way! The dining room set for dinner. And the Breakfast Room will also be set for dinner. It’s like running a small inn or cafe! Tomorrow is Christmas Eve and is all the more exciting because John arrives! Merry Christmas everyone. May it be the jolliest ever for you and yours! 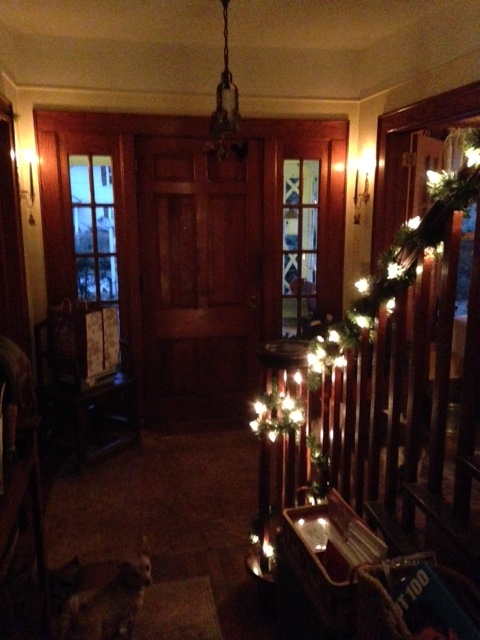 The Entrance Hall with bayberry candles lit at Henwoodie. 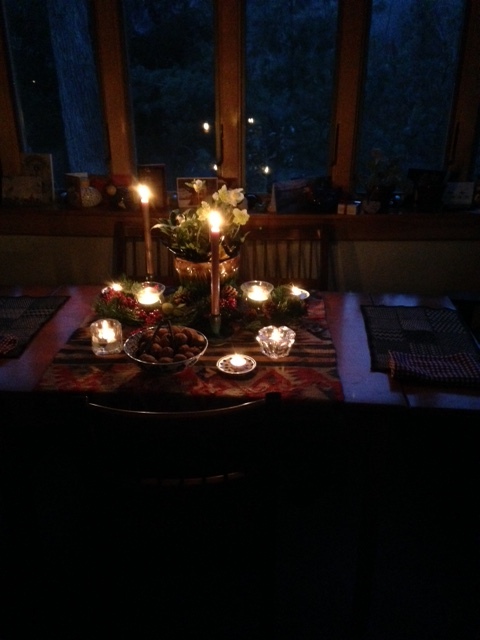 As dusk falls the pups and I roam from room to room lighting dozens of candles and bayberry candles to celebrate the Magic and Mystery of the Winter Solstice. 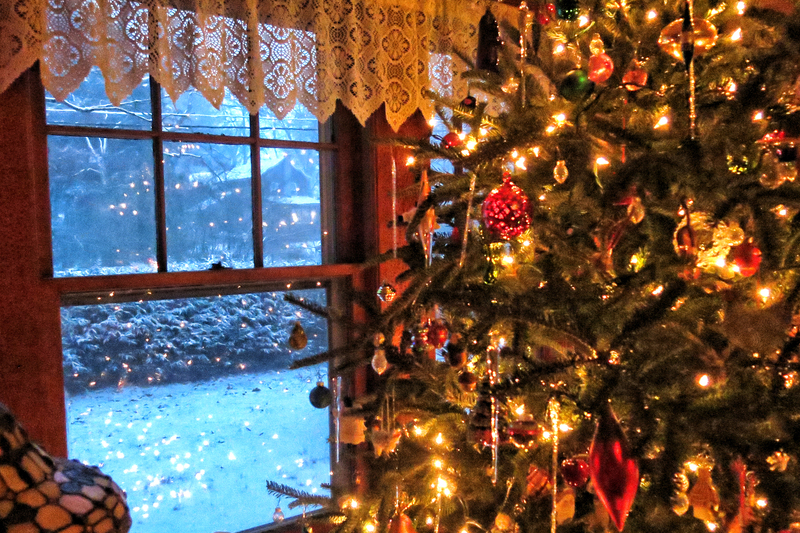 The house is filled with pine boughs and evergreens brought in during the daylight hours. 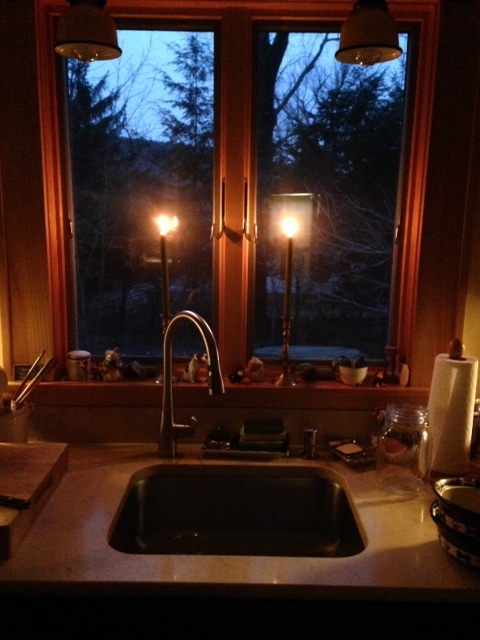 The nighttime is when the real magic begins by the glow of candlelight and firelight. 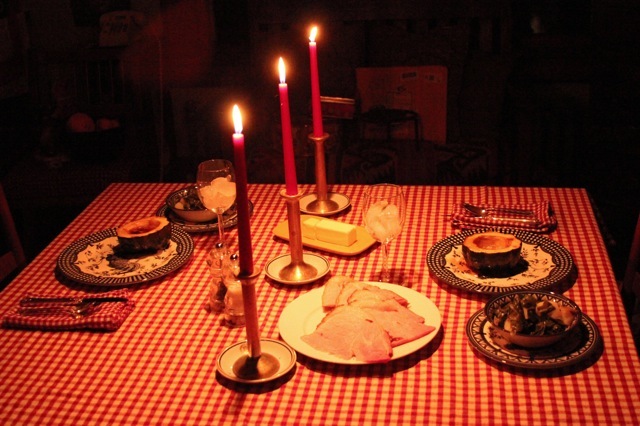 Dinner is eaten by the warm glow of bayberry candles. The meal is simple: ham and roasted small new potatoes, baby carrots, and parsnips. Extra food is put out throughout the day and night for the birds and animals that visit Henwoodie on a daily/nightly basis. The Winter Solstice is a time for sharing and reflection. 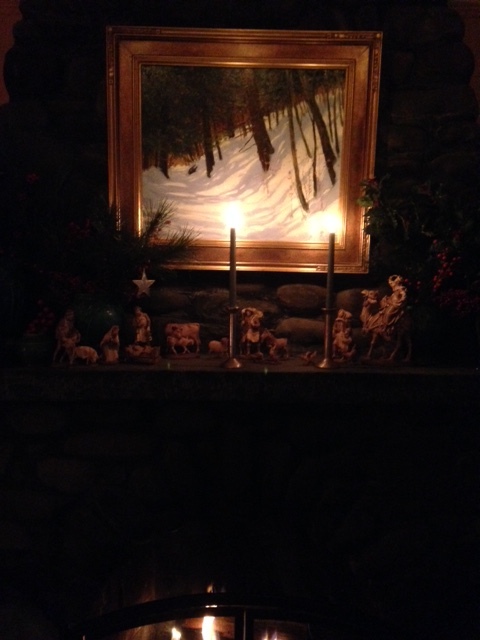 Two solitary bayberry candles light the Nativity crêche and winter painting that hangs above the fireplace. A cozy, cheery fire is kept burning in the fireplace all night long while the bayberry candles burn down to the socket of the candle holders. With the lighting of each candle a silent prayer is said in hopes that Health, Happiness, and Prosperity will come to us and all who visit here. It’s an annual ritual I have performed for fifty years now. Even in the kitchen windows bayberry candles burn as a welcoming beacon to the deer and animals that visit the side lawns for food and shelter from the bitter cold of the darkest night of the year. The library table in the living displays my collection of favorite lighted houses, bears, and Pere Noels. 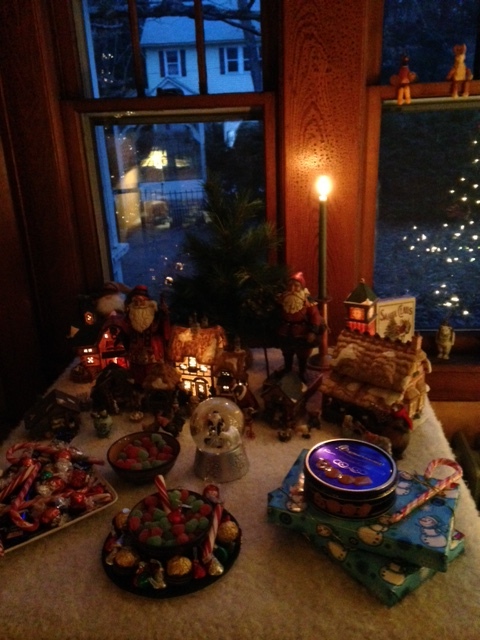 Holiday treats are put out for everyone to enjoy as the enter the living room on their way to sit by the fire. Our dear friend, Iris, joined us for dinner and storytelling by fire. Maddy, one of our tiny rescue pups, did everything she could to stay as close to Iris as possible. Here is Iris greeting Maddy, who had clambered up onto the Mission bench and put her front paws on the table so that she could attract Iris’s attention. It was a dark, dark, cold, cold night. But no snow. 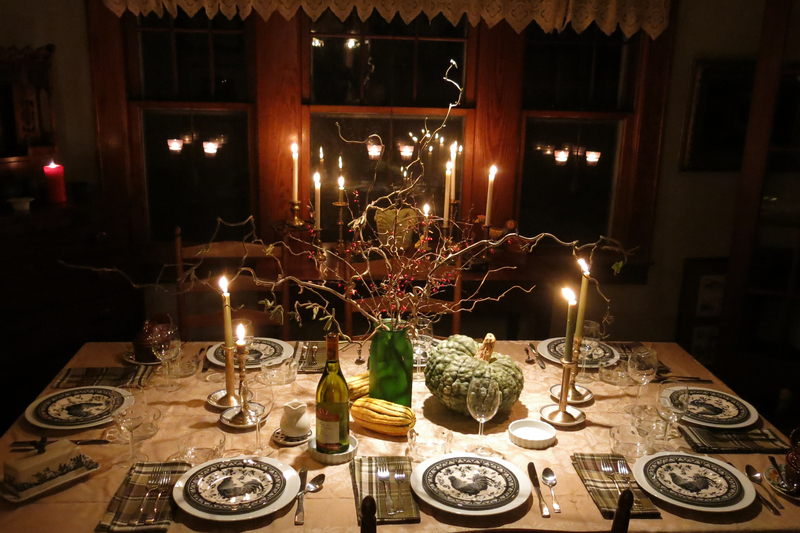 The house was filled with the fragrance of pine and balsam and bayberry. Stories were told, memories recollected, and news as to what’s going on now in our lives were the order of the night as we sipped hot coffee and ate cookies and chocolate pie by the fire. Iris departed just before midnight with a box of bayberry candles in hand to burn on Christmas Eve in order to bless her and Mary’s house during the holidays. At midnight, the pups and I bundled up and trundle out the door to take our Winter Solstice walk in the woods just off the lower gardens. The trees held their breath as we passed and there was a still, hushed silence that hung in the cold night air. 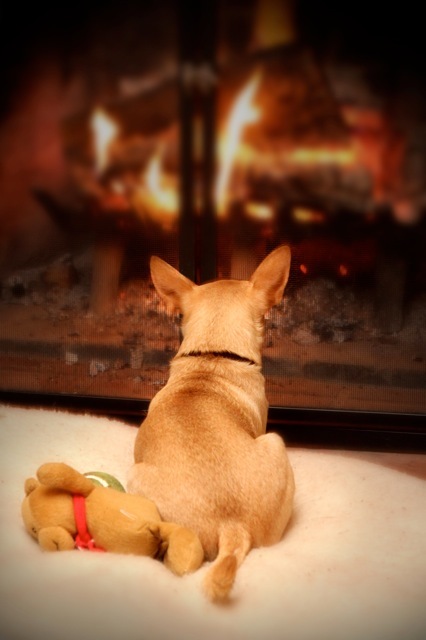 Back at the house, the pups snuggled under their fleecy blankets or stretched out in front of the fire. I would stay awake until the last of the bayberry candles had burned down and extinguished themselves. The night was quiet and still. Only one person was missing who could not be with us for the Magic and Mystery—John. He will arrive on Christmas Eve when we will celebrate the second night of the holiday with our traditional rituals. Friends begin arriving on the 23rd and family will join us on the 26th. For us at Henwoodie the holidays really do begin on the Winter Solstice and will last right through the New Year’s Eve celebration! 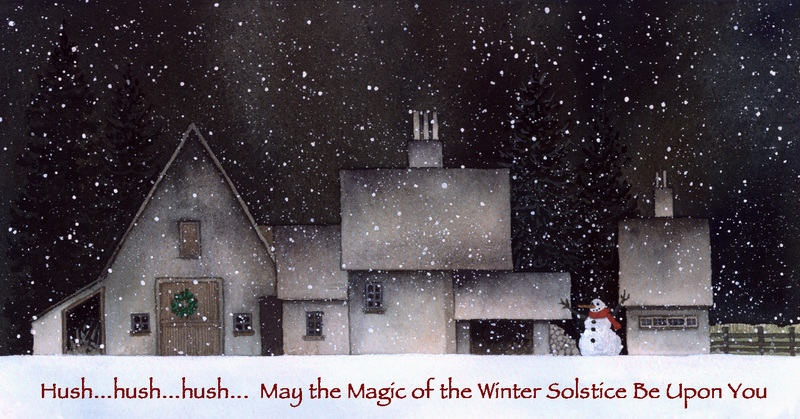 I hope everyone who reads this blog had a Wonderful Winter Solstice and an upcoming Merry Christmas and Happy New Year! CHRISTMASES PAST: Over coffee this afternoon Ed and I reflected on our Christmases over the past 40 years. Some of the happiest, we both agreed, were those when we were flat broke, had no money, no food, nothing at all. Those were the years we did our best to make certain no one knew how little we had. During those lean years we had to be very creative with gifts to give to friends and family. We took blocks of scrap wood from Ed’s workshop in the basement and scraps of fabric that I had saved for quilting projects and made sets of Christmas tree ornaments to give as gifts. We covered the blocks of wood in glue and “wrapped” them in fabric to look like presents. Luckily, I always hoard bits of ribbons and odds and ends that we wrapped around the blocks of wood. We gave these as gifts, in sets of three, and were thankful we had creativity to offer. Another year we ransacked my fabric boxes (I had been a costume designer in the theatre) and spent a frenzied week sewing and quilting potholders to give as gifts. One friend thought they were so artistic that he refused to use them and instead had them framed as art! They still hang on his walls to this day. And, of course, being so broke we had no money to buy gifts to put under the tree so, again, we turned to theatrical illusion. We wrapped empty boxes in whatever wrapping paper and fabric we could find and put those under the tree. I don’t think anyone ever caught on that we had nothing but our own company and our dogs. And we were happy. During those lean years one of my mother’s neighbors, an older German woman who had been interned in a concentration camp, always made a huge assortment of Christmas cookies. She always put a big box together for us. I think she somehow knew we didn’t have a great deal in our house to eat and she made certain we had Christmas cookies. Looking back at how little we had and how many years we literally had very little food, Ed and I agreed that we never felt unhappy. We look back at laugh at what I call our “poverty bread” years when all we basically had to eat was a mixture of flour, water, salt and a bit of baking soda from which I made an unleavened bread. One year we ate that bread for almost the entire year and very little else. We used to keep bacon grease in the ice box for cooking purposes, but that year it was what we smeared on the bread (thinly) for us and the dogs to have a bit of protein and flavor. I never worry about the Great Recession because I know we have survival skills and know how little food it takes to survive. The one thing we did have was imagination and creativity and it was enough. And the unconditional love of our dogs who never held it against us that we were so broke and had so little to give them. So, this Christmas, as I gleefully buy gifts for the pups and John and Ed I’m thankful that I am able to do it. And I don’t feel guilty. When you scrape by for so many years, believe me, you really do relish the “fat” years! And, yes, we still have all the handmade ornaments and hang them on the tree as a reminder that Christmas really is what you make of it. Funny how memories come flooding back during the holidays. The oak trees huddle closer to Henwoodie as if seeking a bit of warmth from the candle glow spilling from the windows. Birds and deer stay close eagerly sniffing and scratching for birdseed and bread put out for them. 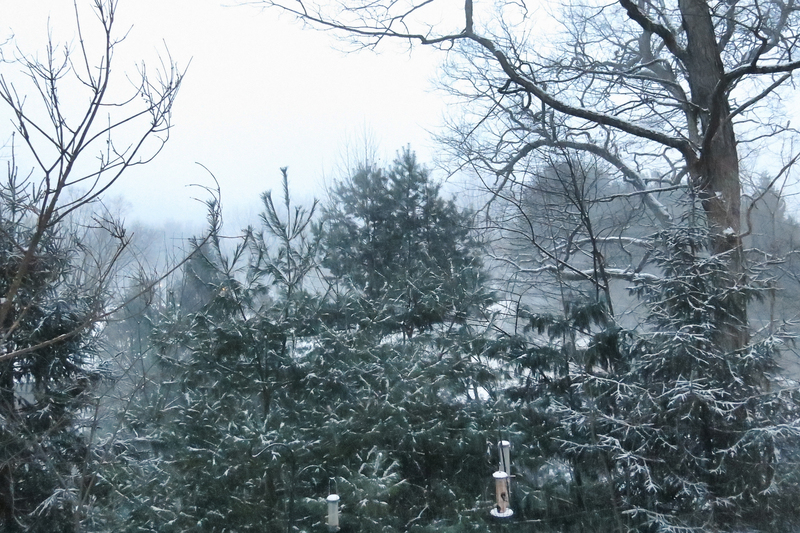 Squirrels and blue jays scramble after peanuts scattered on the terrace and under the snow-ladened hemlocks. There’s a sense of magic and mystery in the air. The Winter Solstice and Christmas are festive days here at Henwoodie. 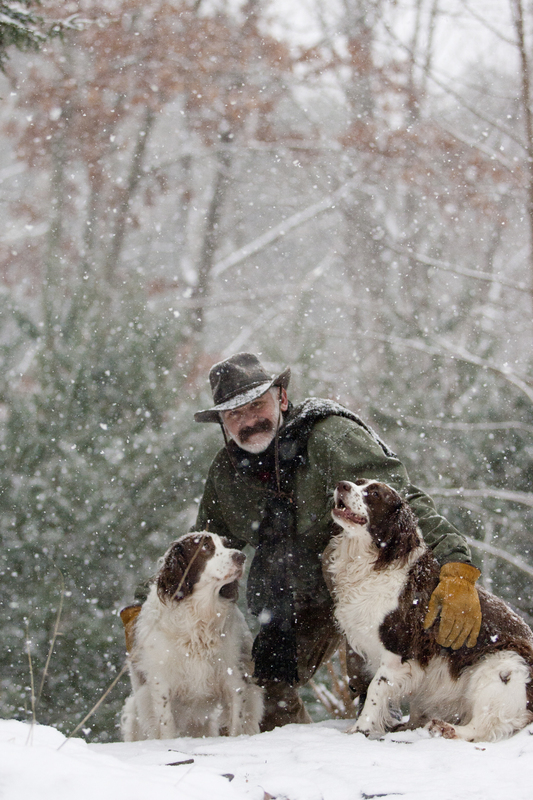 The pups and I will hike through the woods to gather pine boughs and evergreens to fill Henwoodie in preparation for the celebration of the holidays. Snow always adds a touch of magic to the house and gardens. The pups feel the excitement and anticipation as they bound tirelessly through the snowy fields pouncing after phantom voles and field mice. Preparations always begin on 12 December. Over the next twelve days Henwoodie will be filled with the fragrant scent of balsam, bayberry, and mulling spices. 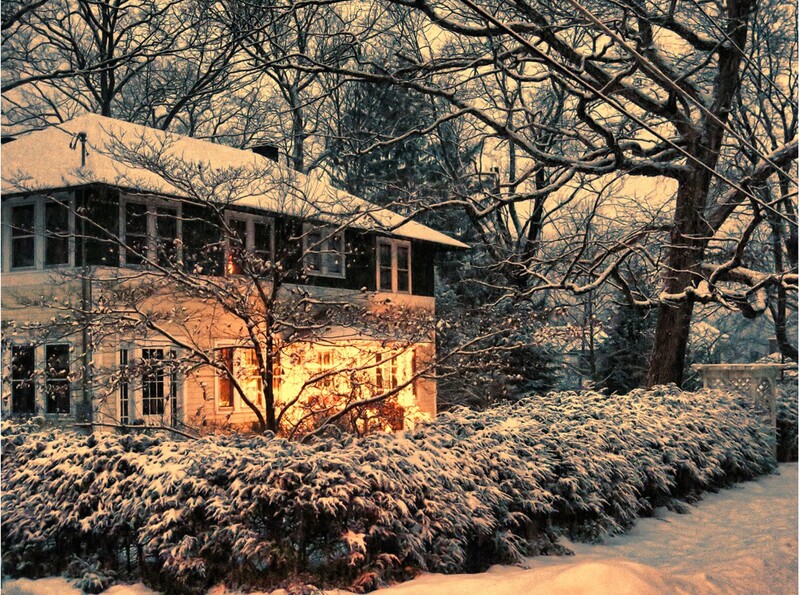 Each day sees the house more and more transformed into a cozy, snug home for the holidays. Holly and wild berries fill vases and crocks adding a touch of Christmas cheer to every room in the house. Life at Henwoodie is one filled with rituals and tradition. Year after year the rituals are followed faithfully and lovingly. Bayberry candles burn all night on the Winter Solstice, Christmas Eve, and New Year’s Eve to ensure that prosperity and health come to all who live here and visit during the holidays. The scent of balsam fills the air and brings back memories of Christmases and Winter Solstices of the past. Nostalgia reigns during the holidays. The final preparations and decorations will be put on the tree and brought into the house on Christmas Eve when John arrives. The anticipation of his arrival is as thrilling and happy as Christmas itself. Evenings are spent playing card games, board games, and watching favorite old movies: Christmas in Connecticut. Miracle on 34th Street, The Homecoming, Prancer, A Christmas Carol, Christmas Story, and more. Friends and family come and stay for days, weeks, and join in the fun sledding down our secret hill in the woods at midnight. The pups are petted and fussed over endlessly. If I had one wish for the world it would be that everyone could be as happy and as snug as we are here at Henwoodie. “It’s snowing!” is the phrase that everyone listens for, including the pups, and propels the household into a frenzy of activity. Boots, hats, scarves, coats, and scarves are hastily pulled on for the long hikes through the snow. Spent the night last night formatting and uploading three manuscripts to be published through Amazon’s Kindle Direct Publishing. I am finally learning how to manipulate my artwork and John’s photos in my basic Photoshop program (PSE9). I don’t have it down perfect yet, but I’m working on it. I love the photo that John took of me walking with my leather shoulder bag on the streets of New York City. He then played around with it in his complete Photoshop program. It’s the perfect cover for this particular story. I do have an alternate photograph that would be just as good a cover—a bit more suggestive. It will be interesting to see if this narrative finds an audience. This narrative is an unusual format for me as a writer. It chronicles the tragic relationship between two men who meet online in a chat room and then in person in New York City. They quickly fall in love, but the relationship is doomed due to a number of complications. First and foremost is the fact that one of the men already has a lover and is in a relationship. The narrative reads in a series of “Moments” that encapsulate the progression and demise of the relationship that lasted only for a matter of months. 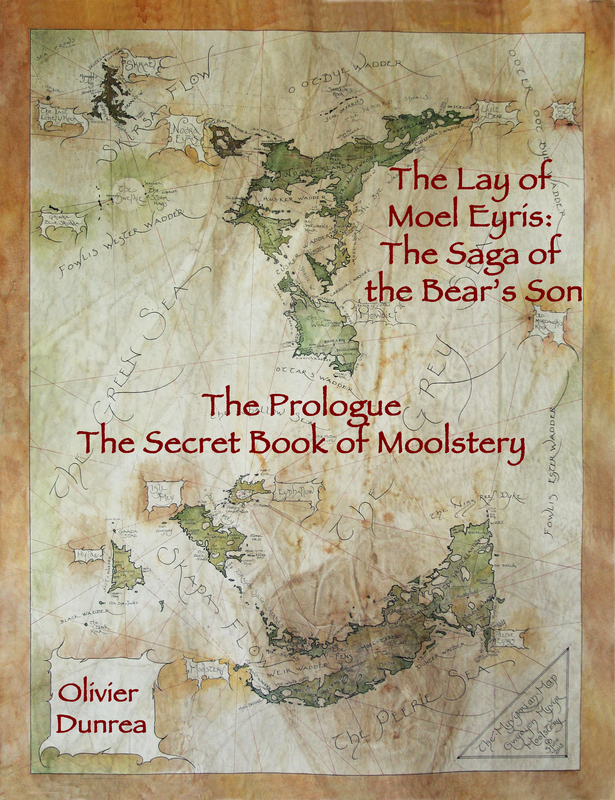 I would like for a larger number of readers to have access to The Prologue to Book One: The Secret Book of Moolstery in my five volume epic heroic saga: THE LAY OF MOEL EYRIS: The Saga of the Bear’s Son. Even though the Prologue can be read at my website making it available as a digital book on Amazon may reach more readers. We’ll see. The Lay of Moel Eyris is an epic heroic quest that falls into the category of ‘motif of folklore’ called Bear’s Son Cycle. The Bear’s Son Cycle is concerned with a baby who was “abandoned” by its parents. The baby grows into a boy who lives apart from his homeland, Moel Eyris—the Islands on the Edge—as they struggled through the most dangerous and blackest years of the archipelago’s history. Finally, the “scenes” that were used to record the videos of me reading this narrative is available for readers to read for themselves. Writing the narrative in a series of scenes was an experiment that allowed me to ‘hear’ the story and make adjustments and revisions as necessary. 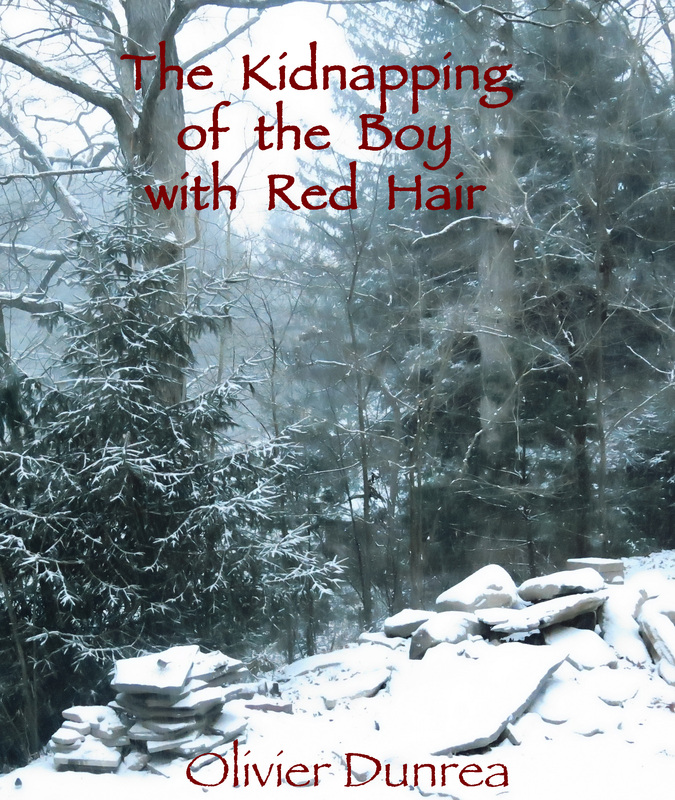 The Kidnapping of the Boy with Red Hair tells the story as to how Maol Rudha, the most revered and powerful Penkyrdd of the Cymry of Maols, came to the “Islands on the Edge”. This is the background story that will not be part of the published series that will comprise the saga. Maols are the revered mythographers who reside in the ancient, isolated settlement called Moolstery. By self-publishing these three manuscripts I am experimenting with marketing and promotion possibilities through this blog, Twitter, FaceBook, Youtube, and my website. All these social media avenues are interconnected. I hope that by posting the news regarding the books that followers and readers just might actually take a look at them. It’s the Grand Experiment, you might say. 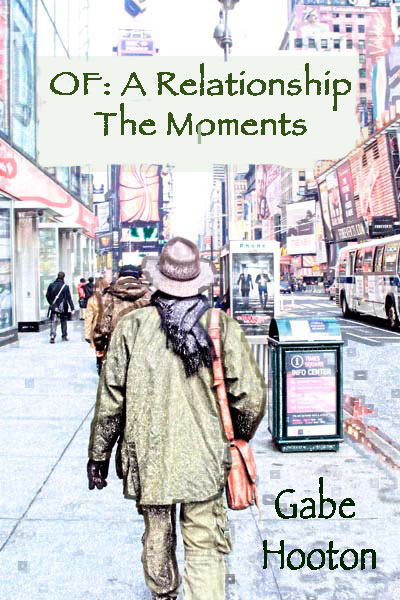 I reread my notes and manuscript for a short piece titled: OF: A Relationship: The Moments. I’m thinking about publishing it through Amazon like I did 4″. The narrative chronicles an online chat that leads to a turbulent, disturbing real life relationship. I wrote the piece ten years ago and think that enough time has passed so that I can publish the writing objectively. Just have to do the front cover art and design. The narrative is divided into “Moments” and the “Moments” comprise stanzas that chronicle the relationship through the months of the year. Here’s a sample of the first “Moment”. Note: The punctuation and capitalization purposefully depicts the style of each of the characters. One man stood in the hotel room in the city, waiting. The other stood just outside the hotel room door, waiting. One man held his breath, the other knocked on the door. He opened the door and took a sharp intake of breath. The other was so handsome; his smile, brilliant. Dinner in a quiet café. They had fallen in love. One man drove back to the mountains from the city. Seventeen messages were waiting for him. His heart sang! He was in love. Every day the two men sent messages and words. One man was from Virginia. The other was from Colombia. Every day they spoke on the phone. One man loved the sound of the other’s voice. The other liked the sweet words he heard. Every night they said “Good night” on the phone. The two men were happy. The two men were in love. The two men were as different as night and day. One was romantic and American. The other was practical and Colombian. But somehow they fit perfectly together. In bed. In heart. In life. The two men chatted online every day, for hours. One man sent chatty “Good Morning” emails every night. The other sent “good morning, handsome” emails every morning. One man was a writer. The other was a mathematics teacher. One man sat at the kitchen table having coffee. Writing. He called at noon during his lunch break. “hey, it’s me,” he said. His soft Spanish accented voice thrilled one man. The other liked his enthusiasm and big moustache. The two men had fallen in love. The two men drove through the countryside. Golds. Yellows. Reds. Ochres. The colours of autumn. One man placed his hand on the other’s thigh; just to feel connected. The other placed his hand on top of the one’s hand; just to feel connected. They talked about their lives, their hopes, their dreams. One showed the other the Ukrainian churches. Shyly, the two men looked at one another. One sighed, the other smiled. The one snapped the photo. The two men sat in a café in the city. One man had driven down from the mountains. The other had taken the subway in from the Bronx. “I would love to see your apartment,’ said one. “No, that is impossible,” said the other. “You ask too many questions,” said the other. “I’ve never been to the Bronx,” said one. “I live with someone, but it’s over,” the other said. One man’s heart pounded in his chest. The other man’s heart was heavy and hard. HENWOODIE IN WINTER: The snow finally arrived! Henwoodie now looks just like the cover photo here on my blog. We keep a cheery, cozy fire burning in the fireplace. Scout cannot get close enough to it and snuggles on the sheepskin rug sighing deeply with contentment. Of course, he likes his treats brought to him so that he doesn’t have to leave his warm spot. Maddy, of course, likes to be buried as deep under a pile of fleecy throws as she can get. Her treats are slipped to her underneath the throws. Fergus, Peedie, and Sophie stake out the back of the wide leather sofa so that they can watch all the coming and going in the house. And be easily accessible for treats. Bridey has to be on my lap, in my lap, snuggled up to me as close as she can get. 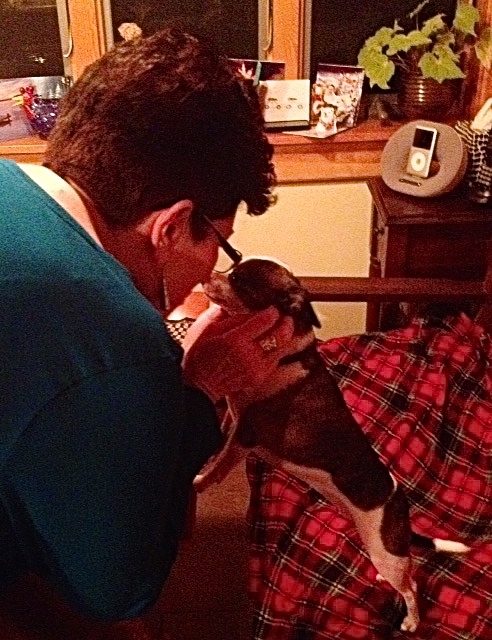 She is a loving wee pup and has to have her kisses every half hour. She climbs onto my chest and put her front legs on either side of my neck and presses her face against my mouth to be “nuzzled” noisily. Thankfully, Molly and Gabe like to stretch out on the carpet and be fussed over every now and then. Gabe is thrilled with the snow and wants to be outside every 15 minutes. He is the Guardian of the wee pups and won’t come in unless ALL the little ones are inside. I always know if I have left one of the little pups outside because Gabe will not leave the front porch. 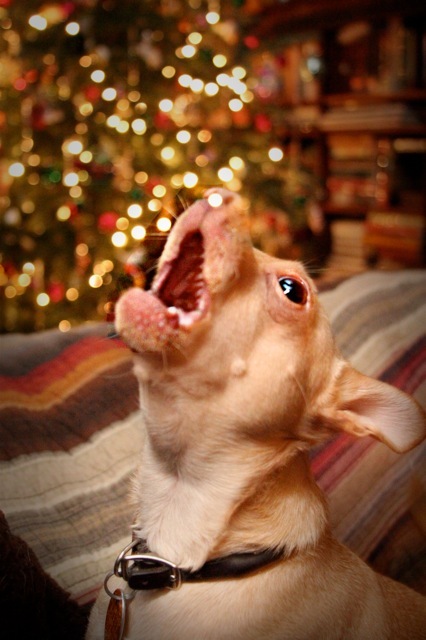 Christmas music fills the house—both medieval traditional carols as well as Barbra Streisand singing about her traditional Christmases of days past. Strange mixture, I know, but it’s Christmastime. The fragrance of hot gingerbread wafts through the house. Wintertime is gingerbread time. I made certain to leave boxes of gingerbread mix at John’s house so he can have hot gingerbread too! Winter is the time of year when I am at my most productive as both a writer and illustrator. I like watching the snow falling outside while I am snug and warm with the pups inside. Somehow the snow inspires ideas and energy to write my fingers off and draw and paint like a possessed elf. Ah, winter! So, happy winter, think snow, get out and play!